Infowiz Software Solutions provides Best Microsoft Azure Training in Chandigarh as per the current industry standards. Infowiz training programs will enable professionals to secure placements in MNCs. Infowiz is one of the most recommended Microsoft Azure Cloud Training Institute in Chandigarh that offers hands-on practical knowledge / practical implementation on live projects and will ensure the job placement with the assistance of advanced level Microsoft Azure Cloud Training Courses. At Infowiz, Microsoft Azure Training Institute in Chandigarh is conducted by specialist working certified corporate professionals having 8+ years of experience in implementing real-time Microsoft Azure projects. Azure Training Course is designed to give a comprehensive overview of using the management portal of Windows Azure and its features. The essential objective behind this training is to teach students how to use various services provided by Windows Azure. Infowiz Chandigarh is one of the Best Azure Cloud Training institutes in Chandigarh with 100% placement record. Our High-tech labs give the student the hands-on experience on all the devices on which student need to work after finishing with the azure Course. Azure Cloud Course objective is to make the student industry ready most of the students who are finishing azure course from Intaglio are getting placed in MNC, s.
At Infowiz, we provide 6 months of technical assistance after finishing the Azure training course. We have regular batches and Weekend Batches for Azure Training Course. We also used to provide azure Exam dumps to all the students who finish their azure training successfully. We provide 6 months of placement assistance for azure Training & Exam candidates. We used to conduct a lot of seminars also in different colleges around Chandigarh for azure Technology course. Infowiz implements a blend of academic learning and practical sessions to give the student optimum exposure that aids in the transformation of native students into thorough professionals that are easily recruited within the industry. Infowiz Software Solutions is a best Microsoft Azure Cloud Training Institute in Chandigarh, India. Microsoft Azure is known as Windows Azure, is Microsoft’s public cloud computing platform. It gives a scope of cloud services, including those for compute, analytics, storage, and networking. Users can select and look from these services to create and scale new applications, or run existing applications, in the public cloud. Microsoft introduced Azure in October 2008. The cloud platform was initially called Windows Azure but was rebranded to Microsoft Azure in April 2014. Azure competes with other public cloud platforms, including Amazon Web Services (AWS) and Google Cloud Platform. To ensure accessibility, Microsoft has Azure data centers located around the world. As of January 2016, Microsoft said Azure services are available in 22 regions across the globe, including in the United States, Europe, Asia, Australia, and Brazil. 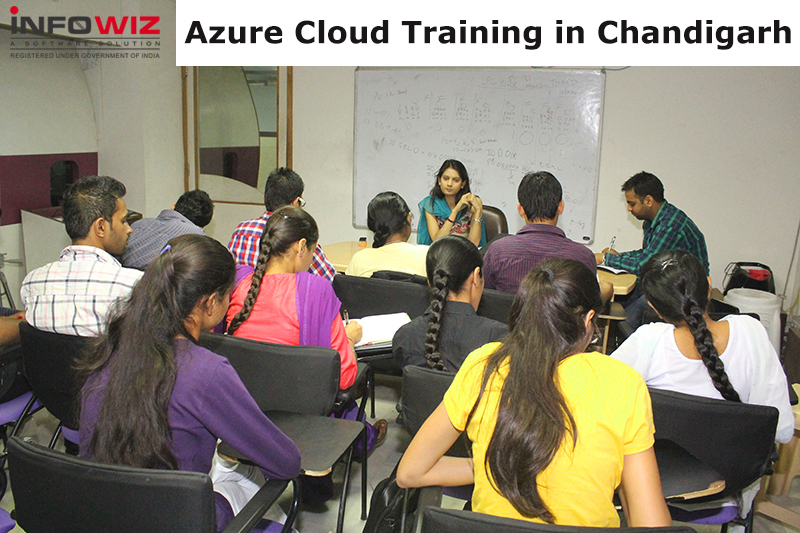 Why you should join Infowiz for Microsoft Azure Cloud Training in Chandigarh? All our course programs are based on live industry projects. All our course programs are based on current industry standards. Training will be conducted on a daily & weekly basis and also we can customize the training schedule as per the candidate requirements. 100% Live Project based training with trainers having 5 to 15 years of Industry Experience. Our Labs are very well-equipped with the latest version of hardware and software. Our classrooms are completely equipped with projectors & Wi-Fi access. Free study material in form of E-Book’s, Online Videos, Certification Handbooks, and Certification Dumps and 500 Interview Questions along with Project Source material. Multiple Payment options such as Cheques, EMI, Cash, Credit Card, Debit Card, and Net Banking.